The number of known specimens of Jurassic period turtles has at least doubled, thanks to the discovery of a large bone bed in China. Found in the northwest province of Xinjiang, the fossil deposit contains the remains of as many as 1,800 turtles. “Bones upon bones, we couldn’t believe our eyes,” Oliver Wings, a paleontologist and guest researcher at the Museum für Naturkunde in Berlin, said. The fossils were found in April 2008 in China’s Turpan Basin. The region, which is likely China’s hottest and driest, lies below sea level. “The area is absolutely desolate with almost no green, but a series of oases are nearby that used to serve as stopping posts along the silk road,” Dr. Walter G. Joyce, a paleontologist affiliated with Germany’s University of Tubingen and Yale University, said in an email response to questions. The fossils are concentrated within an area of less than a hectare in size. A hectare is equal to 10,000 square meters. “Some of the shells were stacked up on top of one another in the rock,” Joyce said. A paleontology graduate student working with Wings on a prospecting expedition unexpectedly found the turtle remains. “Given that the mesa is rather narrow, a colleague decided to check out the other side and was surprised to see turtles litter the surface,” Joyce said. Researchers removed a half-meter square block of the rock containing a high concentration of the fossils for study off-site. They photographed the individual fossils contained in it and, from the number of individual remains found, determined that the density of specimens within the bone bed is equal to about 36 per square meter. Joyce explained that a second area of the bone bed has a lower concentration of fossils and that the team estimated the number of individuals in that section by counting the number of shell pieces found in that area. Joyce added that the specimens are likely to increase the number of known Jurassic turtle individuals by at least two-fold. During the Jurassic period, which ended about 145 million years ago, the area of Xingjiang in which the fossils were discovered was verdant, with many lakes and rivers. Scientists are able to infer the climactic conditions of the area tens of millions of decades ago by closing examining the sediments that surround the fossils. The distinctive red sediments in the particular geologic formation in which the fossils were found indicates that, at the time they were laid down, the climate in the area was seasonally arid. Joyce clarified that the “characteristic assemblage of plant and animal fossils” and “such rarities as the turtle mass grave we found” also give researchers enough information to support that conclusion. The rock layer that holds the fossils, called the Qigu Formation, includes the remains of freshwater mollusks, which indicates the area was periodically subjected to river flows or under a lake. The fossils are not scattered throughout the thickness of the Qigu Formation. According to the paper describing the discovery, the depth of the bone bed does not exceed 20 centimeters. Wings and Joyce, together with their colleagues, therefore concluded that the turtles likely gathered in a dry lake bed to await rain. When the rain fell, it produced a flood that moved the turtles into one place, where sediment buried them. The turtles may belong to a previously unknown species. “We presume we found a new species, but we are not sure yet,” Joyce said. The fossils date to the middle Jurassic, about 164 million years ago. The oldest known turtle species dates to about 220 million years ago. Turtles have existed on Earth for a period longer than snakes, lizards, or crocodiles. Joyce said that the find is likely to help paleontologists gain a greater understanding of Mesozoic turtle diversity. Wings and Joyce, together with other scientists, conducted further examination of the specimens and surrounding rock layer on-site in April 2009 and October 2011. Their research was published in the Oct. 21 edition of Naturwissenschaften. Journal reference: Oliver Wings, Márton Rabi, Jörg W. Schneider, Leonie Schwermann, Ge Sun, Chang-Fu Zhou, Walter G. Joyce. An enormous Jurassic turtle bone bed from the Turpan Basin of Xinjiang, China. Naturwissenschaften, 2012. DOI: 10.1007/s00114-012-0974-5. President Barack H. Obama and his challenger, former Massachusetts governor Willard Mitt Romney, completed their third debate of the 2012 presidential campaign season Monday night without being asked any questions about climate change. It was a continuation of a pattern that, for the first time since 1988, saw no questions about the phenomenon that threatens to significantly alter Earth’s environment and that is likely to cause huge economic burdens to humanity. Although not mentioned during the three presidential candidate debates and single vice presidential candidate debate, both Obama and Romney spoke of climate change at their respective parties’ conventions this summer. The U.S. Department of Defense has listed climate change as among the most significant security threats to the nation, while local impacts within the country could cost the American economy billions of dollars. Record ice melt in the Arctic this year is among the latest indications that heating of Earth’s atmosphere as a result of industrial emissions continues. The debates did include discussion of both candidates’ plans to facilitate increased extraction and use of fossil fuels. There’s a new planet in the stellar neighborhood next door. Astronomers said this week that the exoplanet, which is in the triple-star Alpha Centauri system, has a mass comparable to that of Earth. It is the closest exoplanet to Earth yet discovered. “I’d bet $100 that there are other planets that are there as well,” she is quoted as saying in the story published in the Times’ Oct. 16 edition. While the newly-discovered exoplanet is about the same size as Earth, it would not be a comfortable place for human beings. The planet orbits Alpha Centauri-B, one of the Alpha Centauri system’s three suns, at a distance of about six million kilometers. That is so close that its surface temperature would exceed 2,000 degrees Fahrenheit. By comparison, Mercury is about 46 million kilometers from the Sun at its perihelion. The closest planet to the Sun, the daytime surface temperature on Mercury can exceed 800 degrees Fahrenheit. 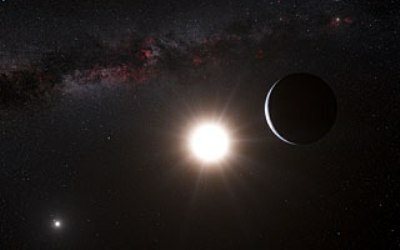 Astronomers used a technique that involves measuring slight changes in the star’s motion caused by the gravitational pull of an object orbiting the star. The newly-discovered exoplanet causes only a tiny wobble in the motion of Alpha Centauri-B. According to a press release issued by the European Southern Observatory, the star’s movement is altered by only about 51 centimeters per second. HARPS refers to the High Accuracy Radial Velocity Planet Searcher, a spectrograph attached to the 3.6 meter telescope at the La Silla Observatory in Chile’s Atacama Desert. Alpha Centauri is located 4.3 light years, or about 25.6 trillion miles, from Earth – a distance that is about 600,000 times farther from our planet than is the Sun. That means it would not be easy to travel to the newly-discovered planet. If a spaceship traveling at the maximum velocity achieved by the space shuttles during their missions in Earth orbit, a journey to the Alpha Centauri system would take approximately 165,000 years to complete. The significance of the planet isn’t limited to its size relative to Earth. It is also the lightest exoplanet among the more than 800 confirmed so far. Astronomers announced the find this week in an article published in the prestigious journal Nature. Artist’s conception courtesy European Southern Observatory, L. Calcada, Nick Risinger.